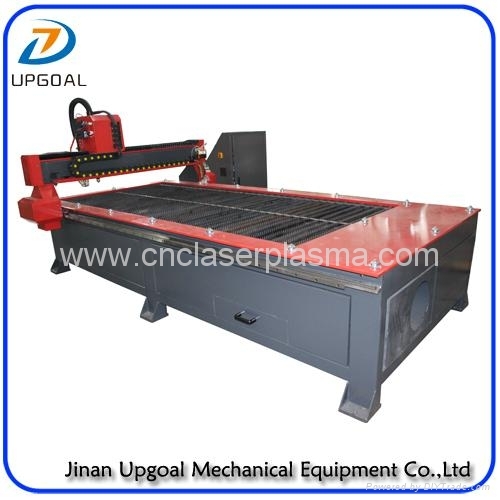 CNC Plamsa Flame Cutting machine, with both plasma and flame cutting torch, high efficiency and energy saving, suitable for all kinds of thickness carbon steel, stainless steel and non-ferrous metal plate precision cutting. 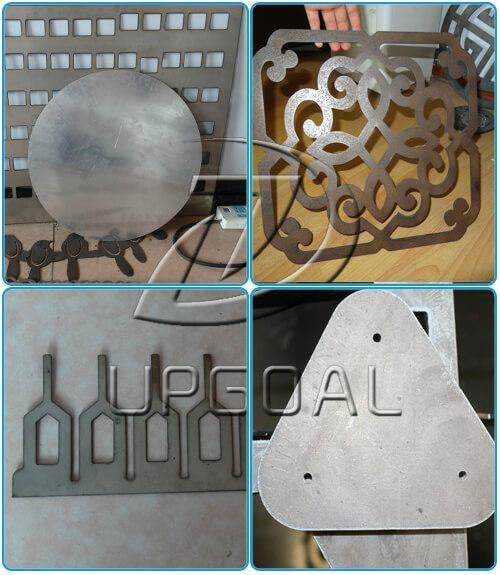 Application: Metal processing, machine manufacturing, auto spare parts, ventilate environment protection, steel structure shipbuilding electrical product’s shell processing, advertisements and signs, decoration, iron art garden, auto making, ship’s electrical parts& plates cutting. 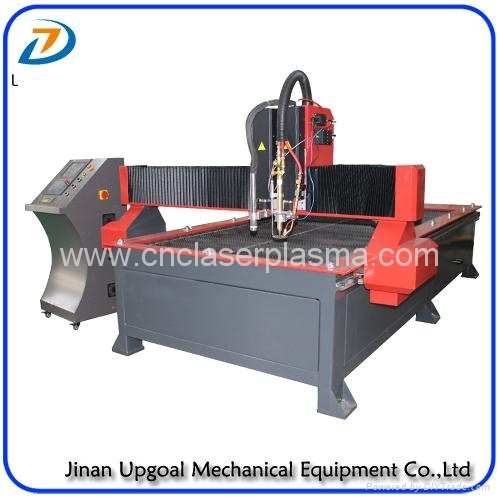 Industrial plasma cutting machine is one kind of high precision mechanical drive and thermal cutting combined high efficiency, high precision, high reliable cnc cutting equipment. Good man-machine interface lets the operating more easy, and cut all kinds of complicated shaped plate rapidly & accurately, especially suitable for middle & thin thickness nonferrous metal plate, stainless steel and carbon steel auto cutting. It adopts integrated modularization design, quickly install, convenient to move. 1. LCD, English display. Has the notes of each operation button on the bottom of displayer in time, so just needs short training, then the buyer can do independent operation, more convenient and easy to use. 2. Powerful anti-interference ability, moving stable and convenient. 3. With cutting compensation function, setting the required workpiece size in computer, nesting and output, can adjust the slotting size in the control system according to needs, easy and efficient operation. 4. Memory function after power failure and break point, no matter power failure or arc breaking during cutting, all can continue go forwarder or back-off following the cutting track. 1. With high sensitivity THC, auto adjusting the best cutting distance, ensuring the workpiece accurately cutting. 2. The torch has auto torch height controller, during cutting, the torch always keeps the same distance with the plate, extend the nozzle’s life time, and get the high quality cutting effect. 1. Z-axis is lead ball screw transmission type, high speed, convenient maintenance,suitable for all kinds thickness of plates. 2. Can auto adjust the cutting distance for uneven plate, ensuring the same distance between the torch with plate, ensuring the cutting quality. 3. Special torch height controller can prevent the torch crash the plates effectively, protect the torch and long time using. 4. With anti-collision device, during the cutting, if torch crash accidentally, the machine will stop immediately, avoiding breaking the machine and thin plates is whiled away due to the cocking. 1. Adopting China famous brand stepper motor and driver, stable performance, high response speed, good anti jamming capability. 2. All the machine’s signal wire is high flexible shielded wire, heat resistant, low temperature resistant, bend resistant. 3. Control signal uses 24V voltage, with famous brand switch power supply. 1. The whole machine bed adopts welded steel structure and then precision-machined, whole tempering, fully eliminate welding stress, stable and reliable performance. Gantry and end beam adopts cast aluminum and then precision-machined, moving performance is good. 2. Dual driving for Y-axis, XY-axis adopts high precision linear square guide rail, Hiwin, Taiwan, good oriented, high precision. Transmission is high precision helical rack and pinion, customized by the specialized manufacturer, surface carburizing quench, stable moving and high precision. 4. Special water table, cutting in the front of water, remove the smoke, create a good working environment. With the post processor for graphic transformation and nesting. 3. Realizing the edge-shared nested during cutting, saving time and materials. Jinan Upgoal Mechanical Equipment Co.,Ltd!